Discovering the state of social media and where it could be headed. Today, 88 percent of U.S. businesses are using social media as part of their marketing efforts. While users use these platforms to interact with friends and specific brands. Evidence shows that they are trying to block businesses from “taking over” their feed. Meanwhile, the social media companies running these networks work to strike a balance. How do you balance between user demands and the opportunity to make a profit from the business interests? This has led social networks to change their algorithm. The goal is to feature user-generated content, unless it’s paid promoted content. In 2013, Facebook enacted this change first. This resulted in businesses losing 40 to 80 percent of their reach. 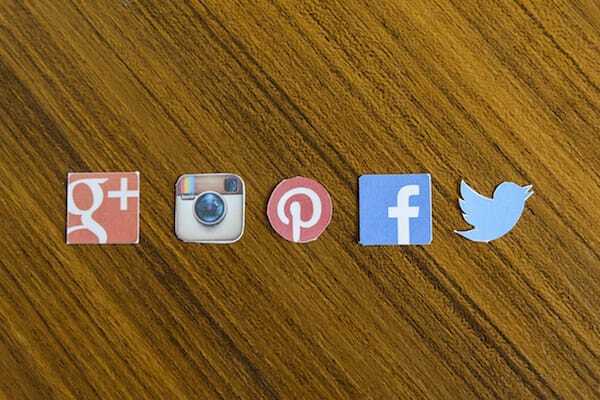 Since then, other social networks like Twitter, LinkedIn, Instagram and Pinterest have enacted similar algorithms. In 2015, according to eMarketer, there was a 33.5 percent increase in ad buys on social media, which totaled to over $23 billion dollars. It’s expected that by 2017 social network ad spending will increase to almost $37 billion. Facebook advertising revenue jumped 57 percent in Q1 of 2016 to $5.2 billion. LinkedIn’s ad revenue grew by 29 percent in the 1st Quarter of 2015 to $154.1 million. Twitter in fourth quarter 2015 made $641 million from advertising. That was up 48 percent year-over-year and with mobile accounting for 86 percent of that sum. By 2017, Instagram’s global mobile ad revenues reached $2.81 billion. This accounts for over 10 percent of parent company Facebook’s global ad revenues. Snapchat sold its first ad in October 2014. This brought in $3 million that year, and is on track to generate $100 million in revenue in 2016. 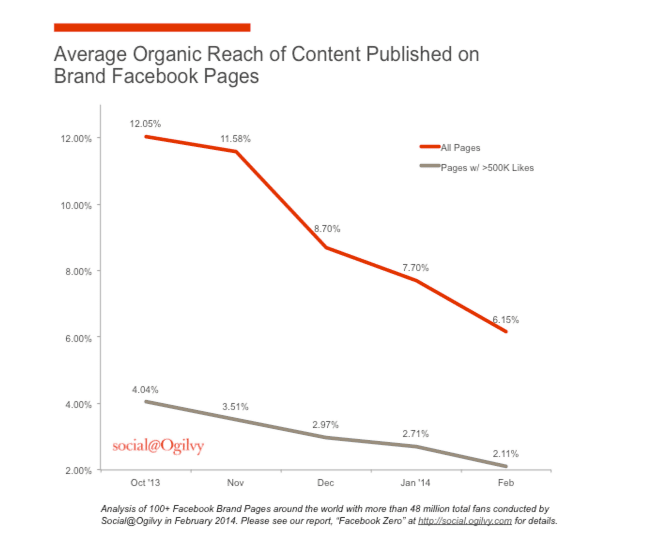 On Facebook, organic reach is dying. Content from brands and small businesses have fallen to less than 2 percent of all fans. As far back as 2015, AdWeek reported that the average growth for organic likes on Facebook was 0.53 percent. LIkewise, pages with fewer than 1,000 Likes saw that figure rise to 1.62 percent. They also reported that of the 2 percent of those you are reaching, only 11.83 percent would actually engage with the post. This means even the best content is not going to be found organically on social media. In response, most small businesses are spending an estimated $5 to $50 a day on promoted posts and ads on Facebook. 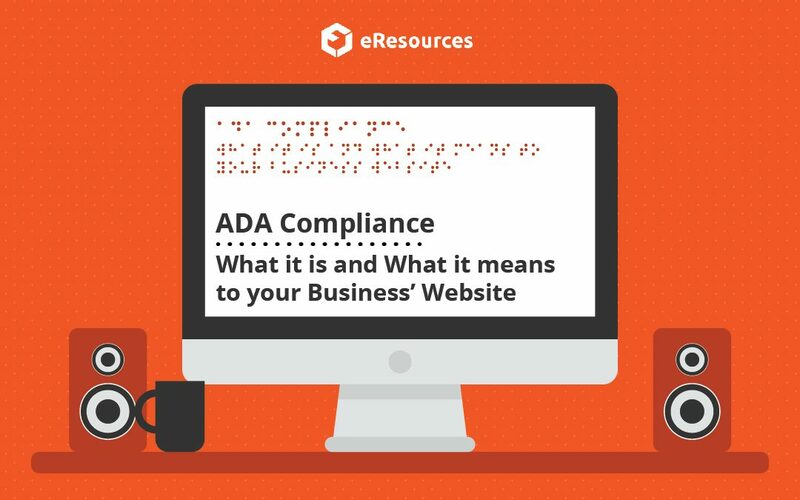 Typically, eResources recommends spending at least $250 a month between promoted content and ads on the platforms where your target audience is most active. eMarketer reported that 61 percent of B2C businesses using promoted content found it an effective way to communicate with their audience. 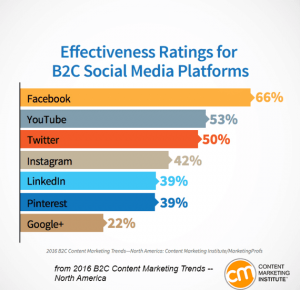 This same study also revealed that marketers found Facebook to be the most effective social media platform for marketing. In addition to increasing your reach, paid promotion also gives organizations the benefits of enhanced audience targeting, A/B testing capabilities, increased video views, and control over the type of device where your ad would be displayed. You can also control how long your posts are visible to your audience. The key to deciding on what you put behind your paid social media strategy is to identify your goals, audience success metrics, and if the level of investment needed to achieve these goals is feasible.